Sweet Pineapple Raita makes for a great accompaniment to any meal. Mildly sweetened yoghurt flavoured with cardamom, saffron with tiny chunks of sweetened canned pineapple, this sweet pineapple raita is a treat in itself. When I first had pineapple raita for the first time at a restaurant when we were enjoying a holiday in Kumbhalgarh, Rajasthan, I thought it was a strange combination, even though it tasted great. Since then I have spotted this dish in the menus of most restaurants and seems like it is quite popular these days. 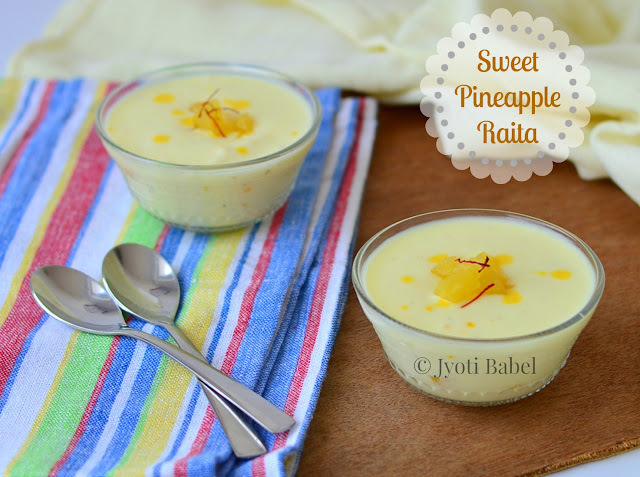 These days whenever I have leftover canned pineapples at home, I make this raita. I have learned to make pineapple raita two ways - savoury and sweet. I am sharing the recipe for the sweet version today. I learnt this from my DH's aunt. She puts in a lot of effort in making any raita. She first makes the hung curd and then whisks the curd using water to get the right consistency for raita. She then sieves it through a nylon net to get a creamy yoghurt. After that, she flavours the yoghurt as needed. However, most of the time I take a shortcut - I just whisk my set yoghurt and proceed with the recipe. If you are not crunched for time, you may proceed with the elaborate process. 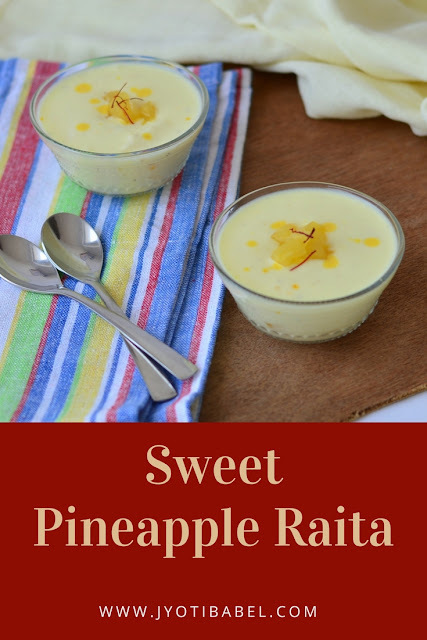 The recipe for this version of raita is quite similar to shrikhand - it's just that we are adding pineapple here and the yoghurt is thinner than that used in shrikhand. Let's check out the recipe now. 1. Beat the yoghurt with a whisk to get smooth beaten yoghurt. Alternatively, you can sieve it through a nylon net. 2. Add sugar, cardamom and rubbed saffron to whisk again. Keep it chilled. 3. Right before serving, add the chopped canned pineapple and serve immediately. 4. It tastes best chilled. Enjoy. Lovely raita , making it with hung curd is a wonderful idea , , also using a net sieve gives it a uniformed texture , it is more creamy . Good pick . I too would think that pineapple and yogurt is a strange combination. But your photos look so tempting that I'm tempted to try the recipe as I love any type of raita. Wow! This one sounds amazing. Very interesting raita indeed. Never thought pineapple could be used in this kind of preparation. Looks delicious. Lovely raita. I may hang the curds as that is a easy task but sieve it? Must try it will give the raita a lovely texture. Am yet to make raita with pineapple, this raita looks prefect to go with some rotis. I have a pineapple in the fruit bowl. I am so tempted to try this tomorrow! Never tried making sweet raita. This pineapple raita looks amazing.